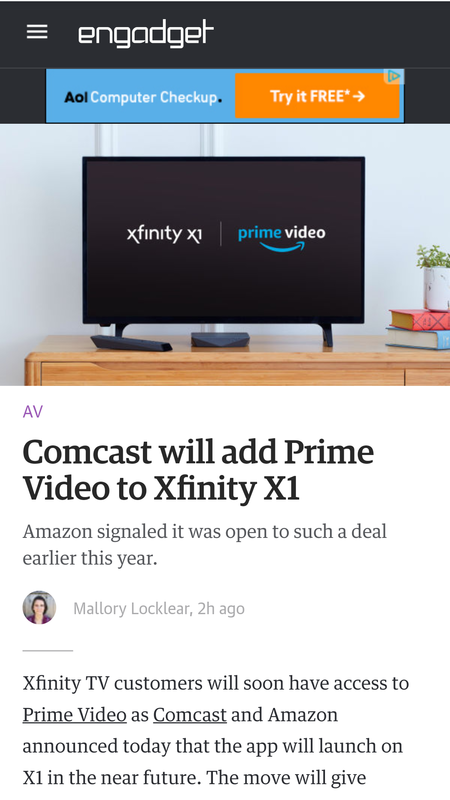 Been hoping to see this but engadget.com just confirmed Amazon Prime video will soon be supported by Xfinity X1 boxes. Amazon said it was open to such a move earlier this year. It's kind of funny that Comcast is including apps associated with cord cutting. "Hey, I like these Netflix and Amazon apps on my Comcast box so much that I don't really watch Comcast anymore..."
It is a little odd but Comcast seems to have partnered with Netflix. The Netflix video quality on my X1 box is far superior to the other streaming devices I've used like the first gen Fire stick and Chromecast. Not sure about how it stacks up to the newer models but it nice to be able to use one remote to control everything.